Just so you are all informed, I will cease posting on this blog, effective 1 February 2014. This blog will remain up, so that my past writings on it will still be accessible. Subsequent theology/apologetics articles will continue to be published EAM Canada, so continue to follow both sites, please. For miscellaneous postings, see my new blog, Thought Criminal #219. There are exactly 15 ayat in the Qur'an, spread out across 5 surat, that contain what are claimed to be sayings by Jesus (3:49-52, 5:112,114,116 19:30-33,36 and 43:63). This does not include verses which mention Jesus but do not include any sayings attributed to Him. Not a single one of the aforementioned sayings have any parallel in Jesus' actual teachings in the New Testament. In fact, some statements are directly opposed to them (eg. Surah 5:116 directly opposes what Jesus actually said in Matthew 11:27 and Luke 10:22). Only one of those sayings (comprising 4 ayat) has an identifiable historical setting (Surah 19:30-33). All of the other sayings of Jesus in the Qur'an do not have any setting in time and space (except Surah 5:116, which is supposed to be in the future and therefore has not actually been said yet). The saying in Surah 3:49 is taken directly from the apocryphal Infancy Gospel of Thomas (ch. 2). For more information (including exegesis of the relevant verses and what various tafaasir and ahadith have to say about them), I would recommend getting the aforementioned book by Dr. White. The relevant chapter is chapter five. Perhaps you are aware of The Four Spiritual Laws. You may or may not also be aware that from a Biblical perspective, there are quite a few problems with using these laws as a Gospel presentation. While it presents part of the truth, it make presumptuous claims regarding the person to whom it is being presented (eg. You cannot know what God's plan is for any given individual) and is woefully inadequate in its presentation of salvific themes (eg. Sin is mentioned, but nothing is said about why it merits God's judgment or the fact that man needs to repent from it). You can read more on such criticisms here, here and here. That being said, I do think that there is enough truth in this Gospel presentation that, given some revision (and a complete overhauling of law #1), it can be used to present the Gospel to lost sinners. This is my attempt at a "revised" Four Spiritual Laws. If anyone has any comments or suggestions regarding it, I am more than happy to take them into account. Don't know God? Learn more about how to be in a right relationship with Him here. Dundas Square is one of my favourite places in Toronto. I try to go down there every Saturday whenever I'm able to and see what is going on down there. So earlier today, I was down there spending time with some brothers and sisters who are always down there preaching the Gospel, watching them at work and doing whatever I can to assist in the effort. Now, you may or may not have been down to Dundas Square, but those of you who have seen them can testify that there is quite the cast of characters down at Dundas Square. Some of them are skilled evangelists. Some are not. I've seen people pass by snickering at the way some of them preach. I have to confess that sometimes, it makes me feel a bit awkward myself, but then I notice some of the people stop and talk to them on a one to one basis. Sometimes they even pray for them before they go on their way. That got me thinking: If God is truly sovereign over salvation (as I believe that He is), then He can use anyone to draw His elect to Himself. It doesn't matter if they lack charisma, or even good theology. I see some people down there preaching who do not know the first thing about systematic theology, yet they have evangelistic zeal and are down there trying to reach out to lost souls. And I have seen people get saved through their efforts, so whatever misgivings I may have about some of the brothers' preaching style, I would have to admit that it is still better than no preaching at all. After all, scripture says that God placed His treasures in jars of clay (2 Corinthians 4:7), and if someone with no formal training in systematic theology, apologetics or homiletics leads someone else to Christ, then Soli Deo Gloria! At this point, some of you brothers (particularly if you are Reformed) may shudder at the thought of people who lack good theology doing street evangelism. But let me tell you this: If they're not going to go out and preach, who will? Unfortunately, a lot of the people with good theology are stuck in ivory towers theorizing all day long. Being Reformed, I do value orthodoxy very much, but I stick around with the guys who have evangelistic zeal but lack theological training because I find it a lot easier to fix the lack of theological training than the lack of evangelistic zeal. I disagree with the brothers down at Dundas on a lot of issues, be it election and free will, the continuation of certain charismatic gifts, or our understanding of the endtimes. But those are secondary issues. Remember, Whitefield was a Calvinist and Wesley was an Arminian, but that didn't stop them from teaming up and supporting each other in bringing about one of the greatest revivals that ever took place on the North American continent. If we disagree on an important theological issue (and I am not for a second denying that they are important), then we can discuss and argue about them when we're among ourselves. After all, "iron sharpens iron" (Proverbs 27:17), and if we find someone to be erring on a particular issue, we can always correct that person with the scriptures (cf. 2 Timothy 3:16) but it would be wrong for us to try and tear one another's ministry down over those issues. What is of foremost importance is that those fundamental and historic Christian truths that all born again believers agree upon (the Trinity, justification by grace through faith, the substitutionary atonement of Christ, etc.) are held by us all, and that we are communicating these truths to the lost world around us. 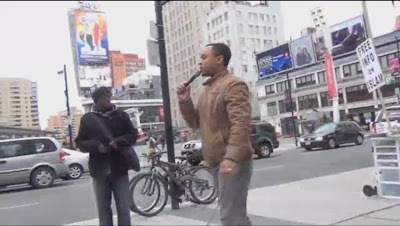 And let me tell you, standing out there in Dundas Square on Saturdays competing with all these rival worldviews is not an easy task. We do not have the abundant store of literature that the Muslim da'ees have, and there is always the challenge of watching out for heretics that try to creep into our midst (because there are some "Oneness" Trinity deniers who occasionally come down to Dundas Square as well, and it is not always easy to avoid their corrupting influence). I see a lot of people pass by us, mocking and jeering at the Gospel and the way we present it. A couple of times today, we got harassed by cussing passersby. But whatever response we get from the people, be it positive or negative, as a Christian I choose to stick with my brothers and sisters rather than join the world in mocking them. I have to say that God does have a sense of humour, putting together the ragtag band that makes up the Dundas Square preaching team. I am more than happy to count myself as part of this ragtag band. The Holy Spirit worked through the apostles to turn the world upside down a long time ago (Acts 17:6), and if God chooses to use these merry men to do the same thing for the city of Toronto, then I will cast my lot with them. After all, we are the Church, and the gates of Hades cannot prevail against us (Matthew 16:18). What that verse implies is that the Church is the one on the offensive, and it does not matter how strong the defenses of Enemy are. If His word is true (and I believe with all my heart that it is), then by God, those gates will fall! And we're not afraid of whatever the enemy has to throw against us, be it belligerent passersby, Muslim da'ees or the "Oneness" heretics. By God's grace, we will overcome. After all, "in all these things we are more than conquerors through him that loved us" (Romans 8:37). So with that, I say thanks be to God, and Marana'tha! One of the passages that I frequently quote on the Sabbatarianism issue is Colossians 2:16-17. I recently used it in an argument with some Seventh-Day Adventists on the issue of whether or not Christians should keep the Sabbath. Since they contested my claim that the passage in question supports my position, I decided to write down my exegesis of the passage. I'm posting it here for future reference purposes, for the benefit of anybody who is involved in this debate. Colossians 2:16-17 (KJV): Let no man therefore judge you in meat, or in drink, or in respect of an holyday, or of the new moon, or of the sabbath days: Which are a shadow of things to come; but the body is of Christ. Original Greek: Mὴ οὖν τις ὑμᾶς κρινέτω ἐν βρώσει καὶ ἐν πόσει ἢ ἐν μέρει ἑορτῆς ἢ νεομηνίας ἢ σαββάτων, ἅ ἐστιν σκιὰ τῶν μελλόντων τὸ δὲ σῶμα τοῦ Χριστοῦ. First of all, it is interesting to note that the passage preceding this (verses 11-15) talks about Christians being the true circumcision, having received a circumcision not made with the hands. What this indicates is that Paul had the circumcision controversy in his mind as he was writing this. Although this epistle was most likely written well after that controversy had already been resolved (cf. Acts 15), the Judaizing heresy was known to have continued in various sectors of the Church well after that (as seen in the existence of such groups as the Ebionites, among others). Paul’s argument in verses 11-15 is that Christians have been made alive in Christ and have been forgiven of their trespasses (verse 13), as Jesus’ death on the cross has cancelled “the certificate of debt consisting of decrees against us” (verse 14, NASB), with the “debt” in question being the debt of sin, which in Paul’s theology has death as its penalty (cf. Romans 6:23). Verse 16 starts with the phrase “Let no man, therefore [Mὴ οὖν τις]...”. The usage of the word “therefore” indicates that verses 16-17 are the conclusion of the argument that Paul is making in verses 11-15. This is where it is important to read Colossians 2:16-17 in light of what Paul has written in his other epistles, particularly Galatians. In particular, we must remember that according to Paul, the Law (with all its accompanying ceremonies, such as circumcision, the temple sacrifices, and keeping of the Sabbath and other Jewish holidays) is meant to be a schoolmaster that will lead us to Christ, but now that Christ has come, we are no longer in need of the schoolmaster (Galatians 3:24-25). That being said, however, the Law is still good, provided that it is being used lawfully. This lawful use is, of course, to convict sinners of their sin and lead them to the Saviour (1 Timothy 1:8-11). When Paul says that nobody is to judge the Colossian believers on the basis of the Old Testament Jewish holidays, he is reaffirming the argument that he made in Romans 14, that the keeping of these holidays should be a matter of the individual conscience, and that Christians should decide for themselves whether to observe these holidays and not force the matter upon any of their fellow believers. In so doing, he is pre-emptively stopping the Judaizing heresy from entering into the Colossian church. Now, one could argue at this point that Colossians is concerned more with Greco-Roman pagan philosophies and proto-Gnostic heresies. While this is true, this does not mean that that is the only issue that he addressed. Heresies come at the Church from all directions, and although the Judaizers are less of a concern for Paul in Colossians, he does recognize the possibility that they may attempt to make inroads into the church of Colossae and is cutting them off at the pass (so to speak). Having mentioned the fact that believers are not to be judged on the basis of the Old Testament Jewish holidays, Paul goes on to make a Christological application in verse 17. Here, he is making a type/antitype distinction, as he states that the Jewish holidays are a “shadow [σκιά] of things to come [τῶν μελλόντων, lit. ‘the coming things,’ a present participial phrase],” and that Christ is the body [σῶμα] that casts the shadow in question. When a figure approaches us from a corner, we usually see its shadow before we see the figure itself. In the same way, the festivals, new moons and Sabbaths are shadows which were cast by Christ before He came into this earth, as a way of letting us know that He was on His way. One of (but not the only) the reasons believers who lived under the Old Covenant kept these holidays was out of faith in God’s promises. But now that the promises have been fulfilled, the body which casted the shadow has arrived, and believers who live under the New Covenant are now to look to the body rather than the shadow, as it does not make sense to look at the shadow rather than the one who casts it. Historical Postscript: To say that Sunday worship has any kind of pagan influence whatsoever is pure speculation. There is zero evidence whatsoever that the Greco-Roman pagan religions involved setting apart any particular day of the week (let alone Sunday) for worship. I would challenge anybody to come up with a credible church historian that states otherwise. Philip Schaff doesn’t say it. J.N.D Kelly doesn’t say it. Jaroslav Pelikan doesn’t say it. So where is this claim coming from? In fact, we know from historical sources that when Christians met for their worship services on Sunday, they had to do so very early in the morning because Sunday was considered an ordinary working day during the Greco-Roman period. Now, as I attempted to search for information regarding Sunday with regards to the Pagans, I did come across some sites which quoted historical sources that talked about the Mithra cult meeting on Sunday. The problem with this is that none of these sources make the assumption that is made by the sites that quote them, which is that Mithraism influenced the Christian Church. In point of fact, anybody who is versed in the history of Mithraism would know that Mithraism evolved considerably in its pre-Christian and post-Christian forms. What this means is that it is more likely that Christianity influenced Mithraism than that it was the other way around (and in fact, there are quite a few historians who will adopt this position). Ironically, this is actually historical evidence in favour of the Sunday worship position, since in order for Christianity to influence other religions into worshipping on Sunday, the Christians must have been worshipping on Sunday! I probably posted these three videos elsewhere at some time or another, but I thought it would help to have these three videos compiled in one single place, for easy reference purposes. Also check out the articles I linked to at the end for more information. Did the Umayyads change the Qur'an? Reformed Internet Ministries - Truth Unchanged, Texts Unchanging? Islam Watch - Would the Earliest Quranic Manuscripts of Sana’a Spell the Downfall of Islam?